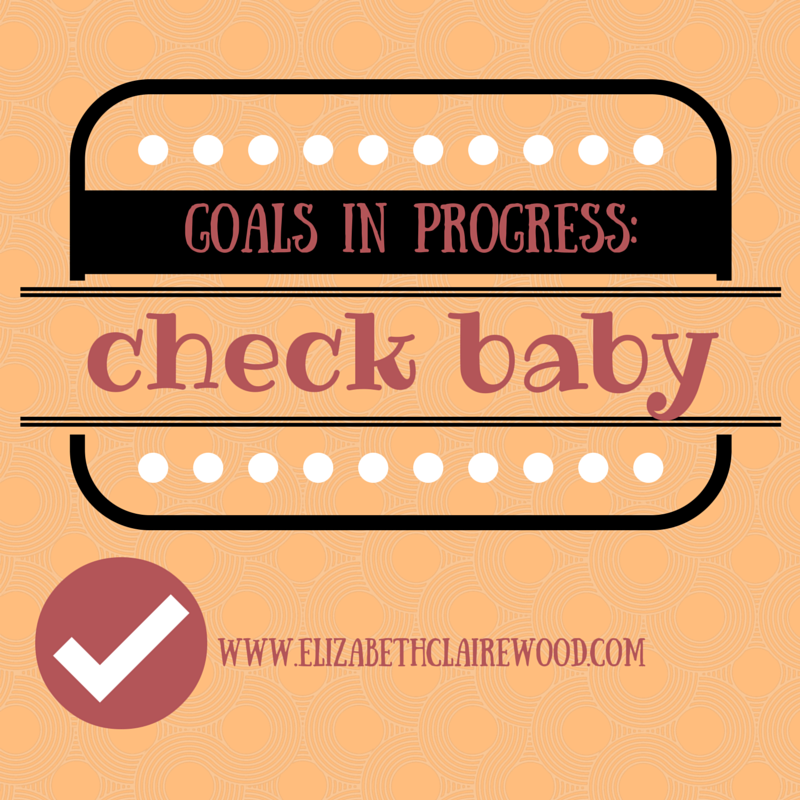 I am purposely updating and checking in on the progress of some of the goals I’ve set for myself in 2015. I find that if I merely say I have goals or even simply write them down, but don’t evaluate and update their progress, then months go by and I have made NO progress at all. You can see the write up of my goals for 2015 here. And here’s an end-of-the-month update for January. It has come to the time in the year when many good intentions, resolutions, goals and the like have been abandoned. This year, I am determined that I’m not allowing my good intentions to fall by the wayside. This year, I’m documenting and keeping tabs like nobody’s business. My heart is to show myself lots of grace in areas where I need to improve. I’m not a slave to these goals. I don’t want goals and the plans to implement them to become a source of stress or legalism to me. I just know that in order to accomplish and achieve the things I want to in this year, I must take actionable steps. I’ve been using this download to track my goals of getting dressed for the day and for exercise. In January my record for getting dressed was 31/31 days; 100% and in February it was 28/28 days; 100%. For exercise in January my record for exercising was 20/31 days for almost a 65% success rate and in February my record was 17/28 days for a 61% success rate. I’d prefer to have had better records for exercising; especially time spent outdoors. The weather hasn’t helped matters and so at the end of February, our family joined the YMCA. I have so enjoyed being back at the Y and have a fitness evaluation scheduled later this week. This is an area where I’m having to repeat the mantra of progress trumps perfection. I’m also keeping a chart/calendar to help stay encouraged to plan at least one special thing that is just for me each month. In February, I attended a half-day seminar led by a fellow chaplain’s spouse who is trained as a Engage Your Strengths-Strengths Finder Coach. Taking this test was one of the best investments in myself I’ve made in a long time. I HIGHLY recommend taking this assessment. If you are of a mind to believe that your God-given strengths are an integral part of who you are and how you’re equipped to serve the Kingdom and walk in your gifts, then TAKE the TEST. I’m already plotting and planning to put some of my results into action. This month, I spent some time working in our home school space and making it more FUNctional. Ryan and I have been praying specifically about school decisions for next year. We have felt a sense of clarity on the issue and plan to proceed with some new twists on what we’re already doing with each of our three children. I’ve continued (slowly) doing a weekly discipleship study with my oldest daughter. As we wrap up our study, I plan to go through additional studies with my youngest daughter and my son, respectively. I have also been a calendar tyrant trying to especially guard and protect family time. It’s a constant battle to keep the main thing the main thing and not fill up every single minute with good things. Reading this has certainly helped. Other priorities have been reading (check) and Ryan and I keeping a monthly date night (check). I have been slowly continuing to read my way through my Bible this year. Many mornings, I have made the decision to open up the computer or read a book while I have my coffee instead of starting my morning with God’s Word. I am to working towards starting my day with the Word. I’ve had it backwards the past week or two and want to get this habit back in check. My PWOC study has been absolutely wonderful and timely. And I have made it a priority to meet a few girl friends for coffee and chatting a few times this month. I also practiced the spiritual discipline of skipping church on a day I needed it. I’ve also tried to show myself that life isn’t about winning, but it is about trying. The kids and I have been ticking right along with their chores (check). Our kitchen is finally finished and back up and running. I have three house plants that are all still alive. A garden that is in the earliest stages and more thoughts on how growing things isn’t always easy. This has been one of my greatest, most laborious and yet, most driving goals of all of 2015. I finished writing about 55,000 words for a book in January. I’d planned for February to be all about revising those ideas and getting that entire project fine-tuned. Instead, my writing focus took on a different, but equally important twist. February has been spent giving my blog an update and working very hard to make this online space a happier, prettier and more meaningful place to land. In January I wrote and published four blog posts. In February, that number was up to 23 posts; a nearly 82% increase in output. I’ve made myself a make-shift editorial calendar to help me keep my posts planned and organized, my ideas visible and added an extra layer of some personal accountability. Additionally, I ran some numbers and statistics on my WordPress site and found that there was a 65% increase in site views and a 70% increase in overall visitors to http://www.elizabethclairewood.com from January to February. I’m not really striving for numbers or a large readership, but the numbers do intrigue me and let me know what kind of audience I am reaching. I was also deeply humbled and honored to be featured as a guest writer on the wonderful Planting Roots blog. I have made efforts to continue wearing through my current winter wardrobe and have not bought any new winter clothes. My birthday did fall during the month of February and I did acquire a few new spring clothing/accessory items as gifts. I’ll have to still (somewhat) delay gratification in wearing these things as spring is still weeks away. I have also been buying my kids some of their spring clothes as I do this every winter. I never wait to buy their clothes until the actual season. I’ve always bought ahead and found good deals by doing so. I did clean out several drawers in the homeschool room and one big closet and took six brown paper grocery bags of items to Goodwill. There has been a good amount going OUT for the few things that have come IN. I have truly come to realize that when I am feeling stressed, tired, lonely or bored, that is when I feel the need to go spend money mindlessly at stores like Target or Marshall’s. I’ve severely limited my time in those stores. I have, however, been conscious of my spending and habits when I have made trips. This is an area where I have really attempted to reign myself in. I’m a work in progress but I do hope to gain a sense of contentment with what I have and avoid falling into the Gimme Trap. It’s March. It’s prime time to give up and abandon the goals and hopes for 2015. Keeping tabs here is my way of saying, “not so fast!” This year is the year for following through. This year is for staying engaged and committed.